Caleb was born on August 20th, 1824 to Dr. Samuel Emlen and Beulah Sansom Valentine. He is listed in the birth records from the Quakers' Arch Street Meeting House in Philadelphia, along with his siblings James Valentine (born 1820) and Elizabeth Ann (born 1822). (Younger sister Mary Cresson came along in 1827.) 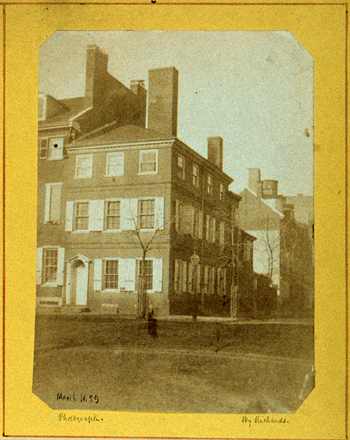 Their place of residence is noted as the NW corner of 7th and Arch Streets in Philadelphia. That's where the Rittenhouse home stood. The Rittenhouse home, also called "Fort Rittenhouse",was built in 1786 by David Rittenhouse, an astronomer, inventor, surveyor, and first director of the United States Mint. Rittenhouse died in 1796, and Dr. Samuel Emlen lived in the Rittenhouse home with his family and practiced medicine out of the house. The house was demolished in 1888. Philadelphia's African American Museum sits on the site now. When Caleb was 3 years old, his father died of "remittent fever". The following year, 1829, Beulah moved with her children to Chester, PA (the Chester Monthly Meeting received their certificates from Philadelphia on 4 Dec. 1829). Beulah married Joseph Lloyd on February 4th, 1830, and had five additional children with Joseph: Samuel Emlen Lloyd, Sarah Emlen Lloyd, Joseph Lloyd Jr., Isaac Lloyd Jr., and Marion B. Lloyd. In 1939, Beulah and Joseph Lloyd moved the family to Wilmington, Delaware. The Wilmington Monthly Meeting accepted certificates for the family from the Chester Meeting on April 3rd, 1939. Then, between 1841 and 1846, Caleb moved about to various places without his family. In the Quaker Meeting minutes, he is noted as "Caleb Emlen (a minor)". His movements were: Wilmington to Darby in April 1841, Darby to Goshen in September 1842, Darby back to Goshen in August 1843, and Goshen to Deer Creek in July 1846. This is probably the time when Caleb was pursuing his education, including his time at the Westtown Boarding School in West Chester. On October 3rd, 1849, Caleb and Hannah's first child, Samuel, was born in Darlington, Maryland. Followed by Mary Dever in 1852, Charles in 1854, John Dever and James W. (twins) in 1859. While in Maryland, Caleb worked in the lumber milling business. The family is enumerated in the 1860 Federal Census as living in Dublin, Harford County, Maryland. Living in the same household with them was an African American woman name Cassandra Warfield (age 22, occupation 'servant') and her daughter Hannah (age 2). 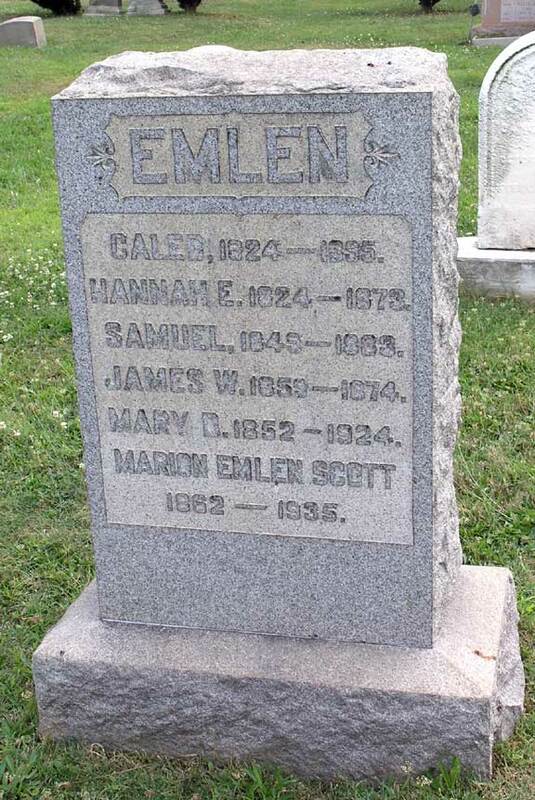 Caleb Emlen (sixth cashier of The Bank of Delaware County, March 24,1864, to November 14,1864. First cashier of The Delaware County National Bank, May 14, 1864, to February, 1874), son of Dr. Samuel and Beulah (Valentine) Emlen, was born in Philadelphia, August 20, 1824. He was educated at the Westtown Boarding School, in Chester county, and early in life embarked very successfully in the milling business in Maryland until his plant and its contents were wholly destroyed by fire. On September 6, 1860, Caleb Emlen was elected receiving teller of The Bank of Delaware County, and on March 24, 1864, was elected cashier, succeeding William Taylor, resigned. May14, 1864, Mr. Emlen was elected cashier of The Delaware County National Bank, whereupon he tendered his resignation as cashier of The Bank of Delaware County, but it was not accepted until November 14, of that year, when the old corporation practically ceased to exist, except for the purpose of winding up its affairs finally. In February, 1874, he resigned his position in the bank. For a time he acted as an expert bookkeeper, but his health failing, he located in Florida; later he returned to Maryland, and subsequently to Chester, where he died March 20, 1895, aged 70 years and 7 months. In 1864-67, Caleb Emlen was a member of the school board of the City of Chester. During the invasion of the State by the rebel army under Gen. Lee, in June, 1863, on the 29th of that month, the directors instructed the president and cashier to make arrangements for the safe depository of the money and other valuables of the bank, if in their discretion such removal was deemed necessary. On Wednesday, July 1st of that year, Caleb Emlen and Jonathan R. Johnson were dispatched in a wagon to Philadelphia with the money and valuables, starting from Chester at a very early hour in the morning. The sum entrusted to these messengers - clerks in the bank - was several hundred thousand dollars, and although they were well armed, their responsibility was so great - fearing lest they might be attacked by parties who had learned of the proposed transfer - that when they placed the specie and other valuables in the custody of the Bank of North America, Philadelphia, to be forwarded to New York with that of the latter bank, should occasion demand it, they breathed freely once more under the sense of relief it brought them. Caleb and Hannah's youngest daughter, Marion Lloyd, was born in 1862. Caleb was baptized as an adult at St. Paul's Episcopal Church in Chester, Pennsylvania on May 30th 1867. The family is enumerated in the 1870 Federal Census as living in the Middle Ward of Chester, Pennsylvania. Living in the same household with them is an African American woman name Mary Johnson (age 40, occupation 'domestic servant') and her daughter Kate (age 10). On July 18th, 1873, Hannah died at the age of 49. She is buried in the Chester Rural Cemetery, the burial officiated by Rev. Henry Brown of St. Paul's Episcopal Church. A year later, one of the twins, James, died at the age of 15 and was buried near his mother. On October 14th, 1874, at 50 years old, Caleb remarried at St. Paul's Episcopal Church. His wife, Mary L. Wright (born 16 August 1836, daughter of Alexander M. & Elizabeth Wright) had previously been married to William H. Reese. Mary and William were married on 31st March, 1864, also at St. Paul's Episcopal Church, but the marriage only lasted three years before William died on 20th July, 1867. I have found no evidence that William and Mary had any children: there are none listed in William's will, dated two months before his death, and Mary is enumerated as living with her parents and sister in the 1870 Federal census. Caleb and Mary's first child, Clement Henry Emlen, was born on April 17th, 1877 in Chester, Pennsylvania. The family is enumerated in the 1880 Federal Census as living on 14th Street in the North Ward of Chester, Pennsylvania. Caleb's occupation is given as "lumber manufacturer". Living in the household with Caleb at the time were wife Mary (age 44, "keeping house"), daughter Mary (age 28, "at home"), son Charles (age 25, "merchant"), daughter Marion (age 17) and son Clement H. (age 3). Daughter Anna Wright was born on February 14th, 1881. Thirty-one years ago there were fewer than 1,000 residents in Apalachicola, this population being supported by one saw mill – that of Coombs & Emlen – and a very limited sponge, fish and oyster trade, the latter dependent for existence on a bad and uncertain schedule of two steamers per week – sometimes one and often none – to transport the oysters, fish and sponge catch to the markets above us. Mr. and Mrs. Caleb Emlen will leave to-day for Appalachola, Florida. Mr. Emlen is in the lumber business in that State and goes to take charge of his interests there. Caleb's sons Charles and John Dever (Uncle Jack) are listed in a 1884-85 census for Apalachicola, indicating that they may have been working for their father at the time. 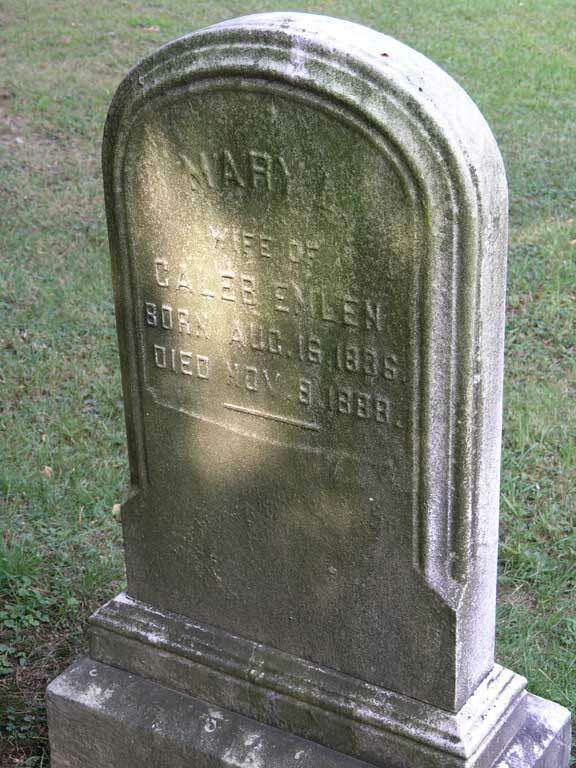 On November 9th, 1888 Caleb's second wife Mary died at age 52, and is buried near her parents in Chester Rural Cemetery. Caleb lived in Florida for a while, before moving to Maryland and finally back to Chester, Pennsylvania, where he died on March 20th, 1895 at age 70. He is buried with his first wife Hannah in Chester Rural Cemetery, along with four of their children.